During the first decade of the 14th century, the most famous teacher at the universities of Cambridge, Oxford, and Paris was Father John Duns of Scotland - the Blessed John Duns Scotus. Not only did he possess one of the keenest and most penetrating minds the world has ever seen, but he was also a humble Friar Minor and close follower of St Francis of Assisi. Born in 1266 at Littledean in Scotland of an Irish family which had settled in Scotland, Blessed John Duns Scotus received his early education from his Franciscan uncle, Father Elias Duns, in the friary at Dumfries. He was clothed with the Franciscan habit in 1279 or 1280; and even before his ordination he taught theology to his brethren (1289-1290). Bishop Oliver Sutton of Lincoln, England, ordained him a priest on St Patrick's Day, March 17, 1291. After he had continued his studies at Paris and Oxford for some 8 years, he began to lecture at Cambridge in 1301 and the following year taught at the Sorbonne, Paris. At that time Phillip the Fair was engaged in a disgraceful quarrel with Pope Boniface VIII, and Father John fearlessly defended the spiritual supremacy of the Vicar of Christ. Thus he incurred the anger of the French king, and together with his thirty confreres of the Paris friary he was forced to flee from the country. Returning to England, Father John then taught at Oxford for some three years (1303-06), and there obtained the doctor's degree in 1304. Soon the fame of his genius and learning spread abroad, and students came in great numbers to sit at the feet of the new teacher. "From almost every corner of the globe," wrote Rodulphus, "large numbers came to see and hear him whom they reverenced as an oracle from heaven." 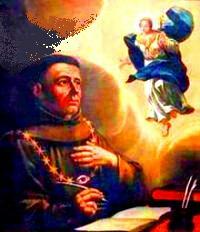 The title of the Subtle Doctor was conferred on Blessed John Duns Scotus; for, as Rodulphus wrote, "there was nothing so recondite, nothing so abstruse that his keen mind could not fathom and clarify; nothing so knotty that he, like another Oedipus, could not unravel; nothing so fraught with difficulty or enveloped in darkness that his genius could not expound." Another writer declared: "He described the Divine Nature as if he had seen God; the attributes of the celestial spirits as if he had been an angel; the felicities of a future state as if he had enjoyed them; and the ways of Providence as if he had penetrated into all Its secrets." In 1306 Blessed John Duns Scotus returned to Paris; and there came to be known as the Doctor of Mary, after he had championed her Immaculate Conception and refuted all the objections of the learned men of the time against this prerogative of Our Lady. "The perfect Mediator," Father John pointed out, "must, in some one case, have done the work of mediation most perfectly, which would not be, unless there is some one person, at least, in whose regard the wrath of God was anticipated and not merely appeased." In 1854, Pope Pius IX solemnly declared the doctrine of Father John, which had always been accepted by the ordinary faithful, to be an article of faith; at the first moment of her conception, Mary was preserved free from the stain of original sin, in view of the merits of Christ. The seal of the Church's approval was also placed on Father John's Christocentric doctrine, when the feast of Christ the King was instituted in 1925. "Duns Scotus," writes father Gemelli, "conceived the universe in the form of a gigantic pyramid, built up of every kind of genera and species, rising upward by degrees, the lower stages united in their most noble part to the higher. . .' Jesus Christ is the culminating logical point of creation.'" Thus, the Second Person of the Blessed Trinity would have assumed a human nature even if Adam had not sinned. Because Adam sinned Christ came as Redeemer of the human race, but He is at the same time King of creation. In 1307 Father John was sent to Cologne, and there he died and was buried in the Minoritenkirche or Friars' Church. The date usually given as that of his death is November 8, 1308; but documents recently discovered seem to indicate that he lived for some time longer. Blessed John Duns Scotus was honored as a saint, and his tomb has been visited through the centuries by large numbers of the faithful. During the Second World War the Friars' Church, which was formerly in the care of the Conventuals, was demolished; and while it was being rebuilt, the relics of Blessed John Duns Scotus were kept in a secret place in the famous cathedral, except for an arm which is now kept in an ancient sarcophagus in the crypt of the Franciscans' new church in another part of the city.